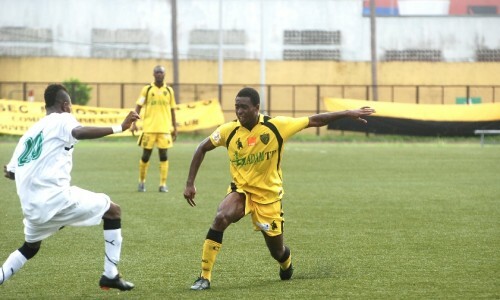 ASEC Mimosas is currently number two in the Ivorian Ligue 1 2012-2013, 10 points behind Séwé Sport. “Les Mimosas” is the most successful side in Ivorian football with 24 titles, the last one in 2010. The current squad of ASEC Mimosas contains several interesting players, but I doubt there is a new Gervinho, Salomon Kalou, Yaya Touré or Emmanuel Eboué to find. Gautier Koffi has been in top form lately. Koffi, traditionally a right-back, has been moved to a more attacking role and is primarily found at the right-wing. The 22-year old speedster has scored an incredible six goals during the last seven league matches, making him the top scorer of the team. The picture is of Koffi and was found on the excellent www.asec.ci. One of the most interesting youngsters at the club is the 16-year old attacking midfielder Adriel d’Avila Ba Loua, a player with experience from the Ivory Coast U-17 national football team. Striker Youssouf Dao, apparently just 15 years old, is another prospect of the famous Académie MimoSifcom who has gotten playing time lately. The 19-year old playmaker Mohamed Wonkoye is a full international player for Niger and one of the future hopes of the West African nation. The lanky Philippe Okan Agoussi is the top striker at “Les Mimosas”. Okan Agoussi, formerly of SO Armée, is often used as a “target-man” and he is effectively using his strenght to make space for his teammates. The “engine-room” of ASEC Mimosas is ran by three important players; the Ghanaian midfield anchor Mark Sekyere, the energetic Michel Mvondo from Cameroon and team captain Hugues Evrad Zagbayou. Earlier this month, Zagbayou, right-back Mahan Marc Goua and the hard-working attacker Koffi Davy Bouah were included in the squad of the Ivory Coast B national football team. Another player that deserves attention is the consistent and highly experienced goalkeeper Sylvain Komeman and centre-back Bangaly Soumahoro, formerly of AFAD Djékanou and the Romanian second-level side CSM Valcea. * Please note that I am missing information about substitute appearances in the match against SC Gagnoa on 02.12.2012 and in the match against SO Armée on 05.01.2013.